We start with a few general notes and explanations. Right after that, the local actions of the neutral building tiles will be explained in detail (in alphabetical order of the tiles). These explanations will then serve as a frame of reference for the local actions of the private building tiles and for the objective cards. Quite a few actions consist of a specific requirement and a specific reward. Only if you meet the requirement are you allowed to gain the reward. Requirements are usually associated with red (red arrows or red numbers), while rewards are usually associated with green and white (green arrows and/or white numbers). Important: You are allowed to forfeit a reward completely or in part even though you meet the requirement. However, if you receive an amount of Dollars as a reward, you must take that entire amount. The most frequent requirement is discarding cards. Wherever an action shows one or more cards with a red arrow, you must discard the exact depicted card(s) from your hand to your face-up personal discard pile in order to gain the reward shown next to it. (As mentioned before, you can perform the action only once, no matter how often you can meet the requirement). Attention: If a specific cattle card is meant, it is represented by its color and breeding value. Whenever we speak of discarding a card, it always implies that you must place the card from your hand face up onto your personal discard pile. Whenever we speak of gaining a specific amount of dollars, it always implies that you must take that exact amount from the bank. Whenever we speak of paying a specific amount of dollars, it always implies that you must return that exact amount to the bank. Whenever we speak of moving your certificate marker forward, it always implies that your certificate marker is moved forward on your certificate track. You can move it as many spaces forward as the particular action icon indicates. However, you can never move your certificate marker beyond your temporary certificate limit (which is 3 at the beginning of the game). Whenever we speak of moving your engine a number of spaces, it always implies that your engine is moved along the spaces of the railroad track. When you perform this action, choose exactly one worker tile from the job market, pay that worker's hiring cost and place him in the worker section of your player board. You are not allowed to hire a worker from the row where the job market token is currently located. Those workers are unavailable until the job market token has moved on. The hiring cost of any of the other workers in the job market is the cost depicted on the right side of his row. However, this hiring cost is modified by the value shown on the action icon itself. After you have paid the hiring cost, place the worker in your worker section, onto the leftmost free space in the row of his worker type. 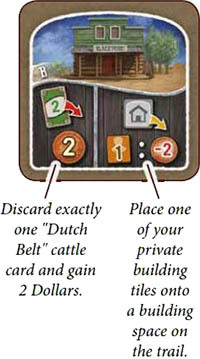 Note that each player already starts the game with one worker of each of the 3 types (cowboy, craftsman, engineer) which means that the first space of each row is already occupied. If the space on which you place the hired worker depicts an immediate action, you must choose to either perform that action immediately or forfeit it. (The icons of these actions should be self-explanatory once you have read the rules). If a row is already full, you are not allowed to hire another worker of that type. At the end of the game, each worker that is placed on the fifth or sixth space of any row is worth 4 victory points. use it to replace one of your private building tiles that is already placed on a building space on the trail. Remember: The side of each building tile is identical for all players. You are not allowed to flip it to its other side. Before choosing a building tile for this action, you must make sure: a) that you have enough craftsman for it AND b) that you can pay that building tile's cost. For each craftsman needed for that building tile, you must pay 2 Dollars. 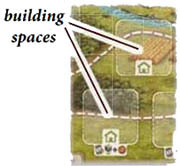 Alternatively, you can use this action to replace one of your private building tiles on the trail with a higher-valued private building tile from above your player board. For this, you only need to have the difference of craftsman between the 2 building tiles and also only must pay the difference. Then put the new building tile in place of the old one and remove that old building tile entirely from the game by returning it to the box. When you perform this action, either choose one objective card from the general objective display to the right of the game board or draw the top card of the objective stack. Place this card face up onto your personal discard pile. If you take a card from the objective display, fill its vacant place immediately with a new face-up card drawn from the objective stack. (See page 15 for the purpose of objective cards). If you move your engine via this action icon, you can move it up to as many spaces forward as you have engineers in your engineer row. Except for the starting space, no space of the railroad track can accommodate more than one engine at a time. This means that when moving your engine, you must ignore any space entirely that is occupied by another engine (as if that space was not there). Along the track, there are several turnout spaces, each of which belongs to a train station. Each turnout space counts as one additional space between the two spaces it emerges from. So coming from a space with a switch, you can either move your engine to the next numbered space or move it to the train station's turnout space (if it is not blocked by another engine). You may always choose to move your engine fewer spaces forward than allowed. However, once you decide to stop on a space, you instantly forfeit any excess movement you might have left from that action. So if you move to a turnout space to upgrade its train station (see below), that action is concluded, even if you moved fewer spaces to get there than you could have. If you stop the movement of your engine on a turnout space of a train station, you must immediately decide whether or not you want to upgrade that train station. Attention: You can only upgrade a train station if you have not upgraded that train station before (which you'll recognize because you'll already have one of your discs on it). It does not matter if any of your opponents already have a disc on it. To upgrade the train station, pay the upgrade cost depicted right next to it. Then place one of your player discs onto its station space (if other discs are already there, put it on top of those). Take that player disc from any of the disc spaces of your player board but bear in mind that the station spaces also either have white corners or black corners. As with the city spaces during delivery, a disc from a disc space with white corners can be placed onto any station space. A disc from a disc space with dark corners can only be placed onto a station space that also has dark corners. After you have placed your disc onto the train station, check whether there is a station master tile placed right next to it. If so, you may now acquire that station master tile by appointing one of your hired workers as the station master. To do this, choose from your worker section any of your hired workers that is placed on the rightmost space of its respective row. Remove that worker tile from your player board, put it in place of the station master tile and finally place that station master tile face up next to your player board. Only at the moment in which you upgrade a train station do you get the chance to acquire its station master tile. If you forfeit that chance, you have no way of getting it later. If you remove a worker from your worker section and thus uncover its immediate action again, you can perform that action the next time you place another hired worker onto that space. 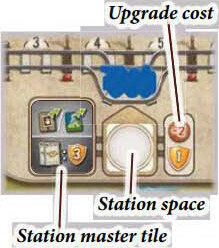 Once a worker tile is placed on a station master space, it remains there for the rest of the game. The upper half either depicts an immediate action or a permanent certificate. If you receive a tile with an immediate action, either perform that action right away or forfeit it. The last space of the railroad track (space 39) is special. If your engine reaches this space, its movement ends there (and you may upgrade the train station as usual). Then you must move your engine backwards. You must move your engine at least one space backwards and may move it to any free space along the track (even a turnout space). After you have done so, immediately gain 3 Dollars. If you did move it to a turnout space, you can immediately upgrade its train station as usual (and even use the money which you just received). When you perform this action, remove one teepee tile of your choice from the Indian trade section and place it face up in front of you. Depending on the money value shown above the teepee tile, you immediately either gain money or must pay money. If the Indian trade section is empty, you cannot get a teepee tile. The auxiliary action section of your player board shows 5 different auxiliary actions. Each auxiliary action has 2 disc spaces next to it. As long as both disc spaces of an auxiliary action are occupied by a disc, the particular action is locked and cannot be used. Only if at least one of its disc spaces has been cleared is the action unlocked and available. Gain 1 Dollar. Gain 2 Dollars. Draw 1 card from your personal draw stack. Then discard 1 card. Draw 2 cards from your personal draw stack. Then discard 2 cards. Pay 1 Dollar and move your engine one space backwards. Then move your certificate marker one space forward. Pay 2 Dollars and move your engine 2 spaces backwards. Then move your certificate marker up to 2 spaces forward. Pay 1 Dollar and move your engine one space forward. Pay 2 Dollars and move your engine 2 spaces forward. Move your engine one space backwards. Then remove one of your hand cards entirely from the game (and thus your deck) by returning it to the box. Move your engine 2 spaces backwards. Then remove 2 of your hand cards entirely from the game (and thus your deck) by returning them to the box. When you are required to move your engine backwards, this is done similarly to forward movement: If a space is occupied by another engine, you ignore that space (thus moving farther backwards). You can move backwards to a turnout space and if you stop there, may upgrade its train station as usual. However, as this is a requirement, you can never deliberately move fewer spaces backwards than required. If your engine is on the starting space of the railroad track, you cannot use an action that requires you to move your engine backwards. Note that the engine is never turned around. While moving backwards, its nose must still keep facing forward. When you perform this action, you can acquire new cattle cards from the cattle market and place them face up onto your personal discard pile. However, the number and types of cattle cards that you may acquire in the course of this action is not xed. Instead, your options depend on how many cowboys you have in your cowboy row as well as how much money you spend. or buying one "West Highland" cattle card for 12 Dollars. 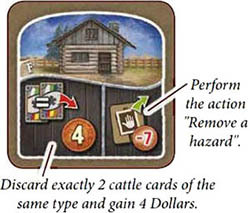 You could, for example, buy 2 cattle cards: For instance, 2 cattle cards with a breeding value of 3 for 6 Dollars each. or one "Texas Longhorn" cattle card for 12 Dollars. This means that the more cowboys you have, the better are your options. How you split your cowboys among these options is up to you, as long as you make sure that each of your cowboys is only put to use once during this action. Any of the cowboys that you do not put to use buying a cattle card during this action may instead be used to draw 2 cards from the market cattle stack and add them face up to the cattle market. This option means: If you put 3 Cowboys to use and pay 5 Dollars, you get exactly 2 cattle cards with a breeding value of 3 each. 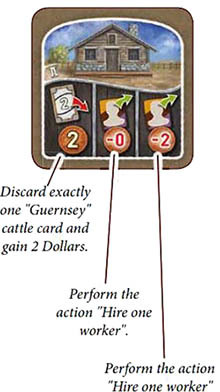 This option means: If you put 5 Cowboys to use and pay 8 Dollars, you get exactly 2 "West Highland" cattle cards. You can only buy cattle cards that are currently available in the cattle market. You can always choose to buy fewer cattle cards than you are allowed. 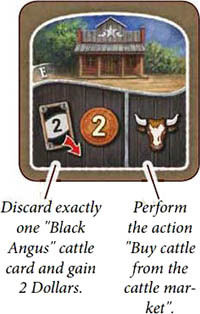 Any cattle card that you acquire during this action must be placed face up onto your personal discard pile. When you perform this action, remove one hazard tile of your choice from any hazard section and place it face up in front of you. If the icon shows a cost, you must immediately pay that many Dollars (otherwise you are not allowed to take a hazard tile). If the icon shows no cost, take the hazard tile free of charge. Each hazard tile has either 2, 3 or 4 victory points printed on it. As usual, you gain those at the end of the game.